There’s nothing like picking a warm peach off the tree in the middle of summer and eating it right then. We call that our 6 o’clock peach. That’s when you bite into it and the juice runs down your arm. That’s exactly what you can do at Fall Creek Farms. When you pick your own peaches direct from the tree, they always taste better! 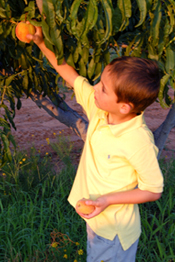 The 10 acre peach orchard at Fall Creek Farms is one of the largest in North Texas. We have more than 800 trees producing delicious Harvester, Rustin Red, Sentinel and Alberta peaches. The public is invited to the orchard at Fall Creek Farms this summer to pick your own peaches.